The safety of public swimming pools in Hamilton County is a priority for sanitarians in Hamilton County Public Health’s Environmental Health Division. A licensing, inspection and education program helps ensure the safety of Hamilton County swimmers whether they’re enjoying a public pool or playing in their own backyard. View the latest Inspection Reports. 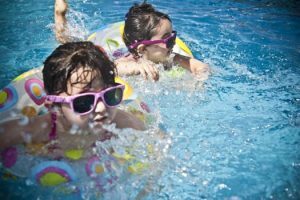 Each year, Hamilton County Public Health issues licenses for more than 380 public swimming pools, including municipal pools, swim clubs, and pools at hotels, spas, and apartment or condo complexes. Licensing renewals now available online! The guide found here Guide for Online Pool Payments will help you navigate this process. Ensure the safety of swimmers (especially children) from drowning, falls and injuries. Control and prevent transmission of waterborne diseases to swimmers through assurance of sanitizer concentrations (chlorine or bromine) and balanced pool chemistry (pH and alkalinity levels). Educate swimmers and pool staff about safety and hygiene practices in pool settings.